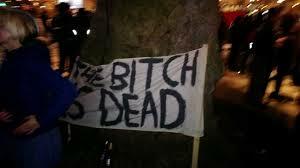 "Aging punk rockers, trade-unionists and decent people around the world greeted the news of the passing of Margaret Thatcher, Baroness Thatcher, with something less than respectful restraint. 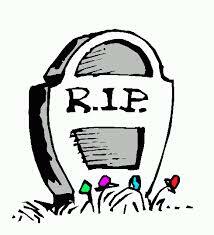 Millions of people had been looking forward to yesterday for years. "It would be a crime to allow hagiography and personality to distract from what made her so deeply despised: She ruined Britain. "Let’s skip the rise-to-power biographical crap — if you care you can see it in the Meryl Streep movie, I assume — and get to the point. She intentionally immiserated millions of English, Scottish, Welsh and Irish people in order to carry out a liberalization of the British economy that benefited the wealthy at the expense of nearly everyone else. Decades after she left office, the country hasn’t recovered. "The second miscalculation was the assumption, made until quite late in the day, that what she was doing to the country could, and would, eventually be undone. This had always more or less happened in postwar politics: little pendulum swings to the left and then to the right along the years. Now, post-Thatcher, the pendulum continues to swing, but inside a clock that has been rehung on the wall at a completely different angle. "This has turned out to be entirely the case, from the subsequent era of rule by New Labour, through the current post-recession austerity experiment. "In the U.K., unlike the U.S., the ruling party is essentially free to carry out its policy agenda, and so they can take all the blame when the result is disastrous. Thatcherism wasn’t a total disaster, if you were, say, a banker. For the rest of Britain, it was obviously a pretty bad deal. As this chart from the Guardian shows, poverty skyrocketed during the Thatcher era — no surprise there, considering the intentional recessions and massive deindustrialization that made up her economic agenda — and never went back down, even as unemployment finally fell to pre-Thatcher levels during the most recent boom." 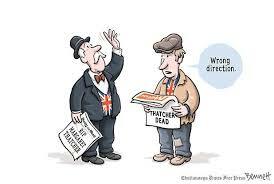 "At the same time, Britain became much less equal. "As the trade unions were broken “The City” — London’s Wall Street — experienced the deregulation and subsequent astronomic growth that would eventually lead to Libor-rigging and, paired with similar deregulatory efforts in the States, the spectacular international financial catastrophe itself. "It is commonly assumed that Thatcher put now jobless miners and other victims of her policies on 'Incapacity Benefit' — their version of 'disability' benefits — instead of counting them as unemployed, to make the widespread economic devastation she was wreaking look less appalling at election time. This would’ve been especially necessary considering that the Conservatives won thanks in part to their famous 'Labour Isn’t Working' campaign, and then they immediately chucked the longtime British policy of full employment. "'Many Tories were appalled by Section 28 right up to one whip who described it as red meat thrown to the wolves in the party. I’m prepared to believe the ex-member of her cabinet who tells me that Mrs. Thatcher has no objection to individual homosexuals and employs quite a few of them. 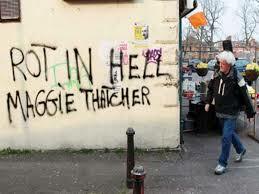 "Thatcher wasn’t just a supporter of brutal Chilean strongman Augusto Pinochet, she was the dictator’s personal friend. "Pinochet was an annual visitor to her home in London after he stepped down from power in 1990, always sending flowers and chocolates on his arrival in England. "Days before his arrest he was invited for tea at the former premier’s home. 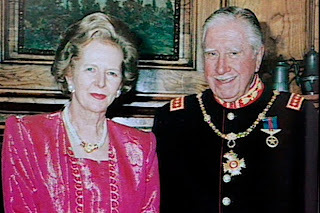 "When Pinochet escaped extradition to Spain for human rights abuses, Thatcher sent him a congratulatory commemorative plate. Pinochet’s military dictatorship killed between 3,000 and 15,000 people and tortured tens of thousands more. “Your return to Chile has ensured that Spain’s attempts to impose judicial colonialism have been firmly rebuffed,” Thatcher wrote in a personal note enclosed with the plate. "Thatcher’s SAS trained and armed the genocidal (but anti-communist Soviet) Khmer Rouge for years. And, yes, she called Nelson Mandela a terrorist. And there was her pointless war in the Falklands, in which hundreds of people died so that the British Empire could prove to itself that it could still win pointless wars. "Margaret Thatcher was a zealot, a friend to the worst mass murderers of the 1980s, a force for antisocial cruelty, and her violent means of ending the great British experiment in social democracy made the country a more brutal, less equal county. One of the most telling, and disturbing, of Thatcher’s catchphrases was 'there is no alternative,' which was always invoked specifically to close off the possibility of considering the many extant alternatives to her top-down class warfare. 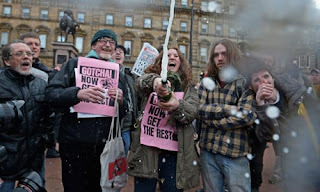 At this point, the alternatives that might’ve produced a more equitable future are indeed long since gone, and the future — for England’s indebted, jobless youth and people the world over ground down by her philosophical comrades — looks about as grim as those horrid 1970s must’ve looked to the people who originally voted Thatcher into office. The world is better off without her, and it would’ve been much better off had she never existed in the first place. "*(Also see this piece for some vintage creepy Thatcher fetishizing by old Tory sots like Kingsley Amis and Philip Larkin. For all the sexist language that Thatcher’s opponents wielded against her over the years, her treatment by a certain class of older British male admirer is its own kind of gross.)" 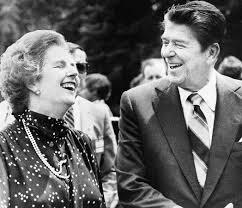 A Reagan Is A Nixon Is A Bush Is A Thatcher...and the old saw about women being 'gentler' rulers bit the dust under Thatcher's regime. We have yet to dig ourselves out of the mess in the U.S. after the Reagan rule (California has yet to achieve the educational standards made before Reagan was governor), much less that of Nixon and the Bush Boys. 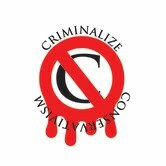 The State funerals of Nixon and Reagan in the U.S. treated those crime czars like statesmen; people in Great Britain either a. know better, b. are victims of the corporate media once again, c. people in Great Britain are allowed to express their opinions of their dead leaders with less fear than those in the U.S., or d. all of the above. The uninformed voter is as unaware as the Conservative Sheeplets of the underlying beliefs of the Conservative leadership, and it seems like the only way to impart this information is through repeated essays like this one. And once the uninformed/low information voters discover those Conservative beliefs, it is only a matter of time before Conservatism is finally made illegal, their front groups exposed, and their leaders brought to court for their horific crimes. "I would have written of me on my stone: I had a lover's quarrel with the world."